Googalies are the softest, most luxurious, and most effective polishing and cleaning cloths ever to touch your fine optical glass. Sunglasses, reading glasses, prescription eyewear, and camera lenses, as well as other fine opticals, have never had it so good. These amazing microfibre suede cloths, made of polyester and nylon, will not scratch, shred, or leave lint as they clean and polish. Several years of research and testing by Andromedan of hundreds microfiber of combinations has resulted in absolutely the best blend of fibers for cleaning and polishing fine opticals, all without the use of chemical cleaning agents. In fact, even the most stubborn greasy smudges are removed with a slighty damp Googalie. Like never before, the glass through which you view your world will be truly transparent. Googalies are not just for glass. These luxurious personal cleaning companions are incredibly effective for everything from computer equipment, CD's, and musical instruments (they are the most effective guitar string cleaners we have ever found - effective enough to add months to the life of your strings), to fine wood, painted finishes, windows and bathroom mirrors. In fact, they are capable of cleaning your whole house, from kitchen to garage - but why waste them on anything but the finest of your possesions. (The Grubbie below is for the real grunge.) Soft and cuddly, Googalies are wonderfully soft to the touch. But don't let their softness fool you. Googalies are tough cleaning tools and, with proper care, should last for many years of daily use. 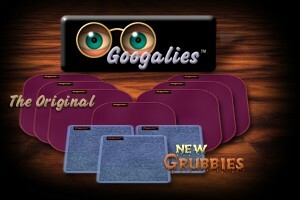 Googalies look great and are perfect for purse, pocket, or just laying around the house, just waiting to be used. Generous size for autos, and all the other big tasks Googalies take on! The above are only a few of the many applications for which Googalies are well suited. For more detail concerning the many uses of Googalies please select the "Applications" link at upper right, or just click here. Beautifully lush and soft, The Grubbie is a 12" square workhorse. As with all Googalies products, they have a wonderful tactile character. But the all new Grubbie is the thickest, toughest microfiber terry cloth we've seen. It will clean your entire environment like nothing else and without the use of chemicals. It is NOT recommended for "coated" opticals like high end polarized sunglasses, prescription eyewear with anti-glare coating, tinted glass, or camera lenses. It is simply too tough. (In other words, while it won't scratch glass, the Grubbie WILL remove the coating.) However, all other glass surfaces as well as greasy cooking areas, floors, bathrooms, grungy sports equipment, and exposed automotive surfaces, will surrender their dirt to a Grubbie like nothing else. Tired of drying your hands with a traditional terry cloth towel only to find your hands are not truly dry? The Grubbie microterry cloth is unsurpassed in its ability to absorb water. In fact, we recommend that you use a hand cream after repeated drying with a Grubbie. This amazing little towel will leave, after just a couple of wipes, absolutely NO moisture on your hands. Imagine what it will do for all other damp surfaces. Or, simply immerse in warm water and wring out and you have a cleaning tool that will blow your mind! And . . with proper care, your Grubbie should last for many years of daily use.